Watching the unveiling of Billy McNeil’s statue on the Celtic Way last season was one of those poignant moments which makes you reflect on what Celtic and the men who have been our heroes in the hoops mean to us. 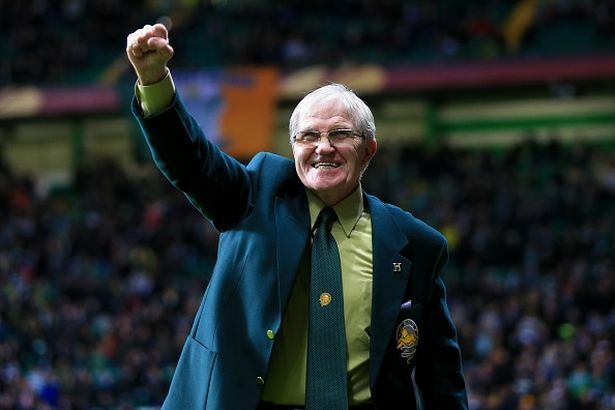 Billy, looking a little fragile, had his old comrade Bertie Auld at his side as he walked down the Celtic Way. 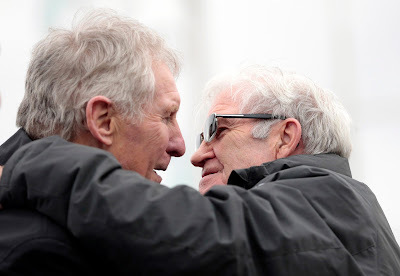 The thousands of watching supporters could see the bonds of affection which still bound these two fine players together. They have both been involved with Celtic for longer than most of us have been alive. When it was over and the modern players had gone inside to prepare for the game and Billy had joined his family in the stadium, wee Bertie was still there posing for pictures with fans, shaking hands and laughing with the ordinary folk of the Celtic support. I shook his hand and thanked him for his efforts for Celtic and the many things he has done for the supporters. As I headed to the game he was still there smiling, joking with the fans and just being Bertie. More than 50 years earlier this Celtic legend was far from Celtic Park having been sold to Birmingham City but plans were afoot to bring him home. So it was that Maryhill boy, Bertie Auld, laid out 56 times capped England striker Johnny Haynes. As the inevitable ordering off came Auld heard Fulham’s centre half Maurice Cooke thundering after him with revenge in mind. The little Scot wheeled around and delivered a pre-emptive uppercut to Cooke’s chin which laid him out too. St Andrew’s went wild as the crowd began to chant ‘One, two, who’s next?’ Such indiscipline was one reason Celtic had allowed Auld to leave in 1961 and the four years he spent in England saw him develop as a player even if it never fully quelled his fiery nature. Bertie won the League cup with Birmingham as well as playing in the Final of the Fairs Cities Cup (the forerunner to the UEFA Cup) but greater prizes awaited him as a revolution was about to begin at his old club in Glasgow’s east end. In early 1965 he was transferred back to Celtic for £12,000 and it is very likely that the soon to be Manager, Jock Stein, had requested his return. The Scottish Cup Final that year saw Celtic pitted against the fine Dunfermline team of the era and even the most optimistic Celtic fan knew it’d be a battle. 108,800 supporters, the vast majority of them Celtic fans, filled the vast bowl of Hampden to see if Stein’s Celtic could succeed where McGrory’s teams had so often faltered. It had been 8 long years since Celtic had won a major trophy but how they roared and sang as Celtic twice fought back from a goal down to balance the match at 2-2 in the final stages. Auld had scored both of Celtic’s goals and had slotted seamlessly into a midfield in which he and Bobby Murdoch pulled all the strings for Celtic. His first goal in front of a packed Celtic end was a breathless piece of action. A Charlie Gallagher shot had smashed the bar and spun high into the air with the goalkeeper stranded. Auld raced forward and outjumped the Dunfermline defender to head the ball home. The massed ranks in the Celtic end exploded in joy. He scored Celtic’s second goal after another fine move and the match entered its final phase with the cup still up for grabs. With just 9 minutes left the huge Celtic support watched a corner glide into the Dunfermline penalty box. Lennox looked certain to leap for it but a call behind him from McNeil saw the winger duck allowing the Celtic skipper to meet the ball imperiously with his head. It exploded into the Dunfermline net and Hampden erupted in sheer joy as Celtic finally broke through to take the lead. The cup was won on that bright day in April 1965 and Celtic looked to the future with renewed confidence. The following season they would be champions and set off on a remarkable period of success. The next few years saw Celtic gorge themselves on success. The hungry years of defeat and disappointment melted away as Stein’s side took Celtic to an unprecedented level of success at home and in Europe. Not only were Celtic winning regularly, they were playing attacking, entertaining football which won them admirers among those who love the game. The engine room of that fine side was Auld and Murdoch who would ping passes to a speedy and very effective forward line. Bertie had found his spiritual home. He was a Celt at heart and found in those exhilarating years the perfect team mates to help him shine. Yes there were still flashes of his temper to be seen and he occasionally took retribution on the odd opposition player who overdid the rough stuff with him or his team mates. He was especially protective of Jimmy Johnstone who took some dire punishment in the more physical environment of 1960s football. Most famously he punched a Racing Club player who had spent the game kicking and spitting on Celtic players. Bertie then simply refused to leave the field when the very weak Referee sent him off. In the Alfredo Di Stefano Testimonial match against Real Madrid, Bertie and Amancio of Madrid went for a 50-50 ball. The Spaniard got a little upset at Bertie’s tough tackling and threw a punch. The Maryhill man answered that in the only way possible by returning the punch with interest. Both players were sent off. But for most of that golden era he prowled the midfield and helped Celtic to glory using his footballing skills rather than his fists. He recounts in his biography Celtic’s date with destiny in Lisbon in 1967 and the period when both teams waited nervously in the tunnel before the game. Celtic’s pale Scottish lads glanced nervously at the tanned Italians standing beside them. Bertie decided then to instigate a song and get the Italians thinking about what they were up against. He started to sing… ‘Hail, Hail, the Celts are here…’ and it spread along the line of Celtic players until they were all belting it out in unison. Suddenly it was Inter who were glancing nervously at the Scots who sang with such defiance. They knew then they’d be in for a game. It could be argued that Jock Stein broke up the Lisbon Lions team two or three years earlier than was necessary. Bertie was freed in 1971 and joined Hibs. His final appearance in the Hoops saw him carried from the field on the shoulders of his team mates. They knew his value as a player, as a team mate and as a man. His career took him into management with Hibs and Partick Thistle and it was during his time at Easter Road he bumped into his old sparring partner, Johnny Hayes, who had retired and moved to Edinburgh. The two old pros shook hands and laughed about their punch up of decades before. ‘I hope you could hit a ball as hard as you hit me,’ Haynes joked. The fans treat Bertie and the Lions so well not just for the success they brought the club on the field but also for the fact they were so obviously committed to the club, so obviously Celtic fans on the pitch. The term ‘Legend’ is banded about too often in the modern era but it can be used to describe Bertie Auld, the Maryhill boy who wore the hoops with distinction. It is now almost 60 years since he first played for Celtic and his affection and enthusiasm for the club has never waned, nor has the affection the Celtic support has for him. As I watched him smile and joke with supporters of all ages on the Celtic Way last year it was obvious to see that he loves being a Celt. He put people at ease and even at 78 years of age knelt for one picture with a man in a wheelchair. He had time for them all, those who had seen him play and those who only heard the legends from fathers or grandfathers. Bertie was phoned one night when he was at Birmingham. The caller said: "how would you like to come back to Celtic?"